September 29, 2016 By This post may contain affiliate links. Turn a simple two ingredient recipe into a treat that will have your party guests on their feet cheering. 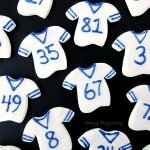 These Fudge Football Jerseys are quick and easy to make and can be decorated in your favorite team’s colors using Wilton Candy Melts. This post is sponsored by Wilton. I have to admit that I don’t follow football much, but last year when my nephew was a senior on the high school football team, I found myself jumping up and down screaming at the top of my lungs when he tackled the star quarterback in the last few minutes of a big game. I don’t consider myself a big sports fan, but I was all in that night. Typically I show my support for the team by making fun treats. 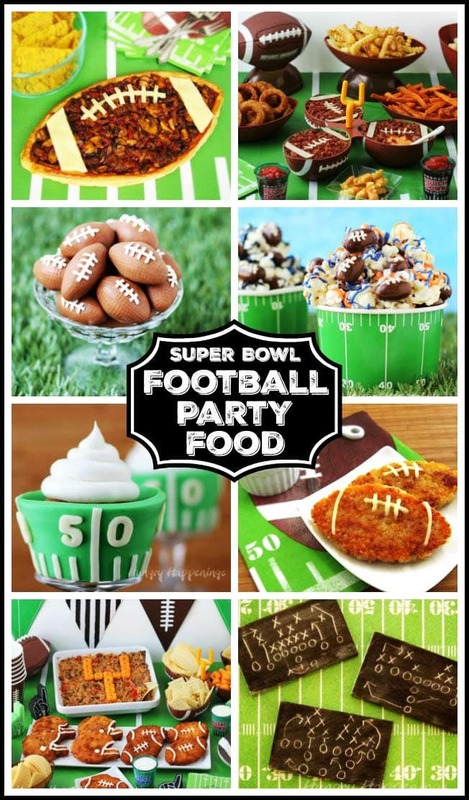 Over the years here at Hungry Happenings I’ve shared dozens of fun food ideas for football season. As the years have gone by I have found that it’s become increasingly difficult to come up with unique new ideas to share with you. There is just so much on-line these days. But, I think I rose to the challenge and created something I’ve never seen before. 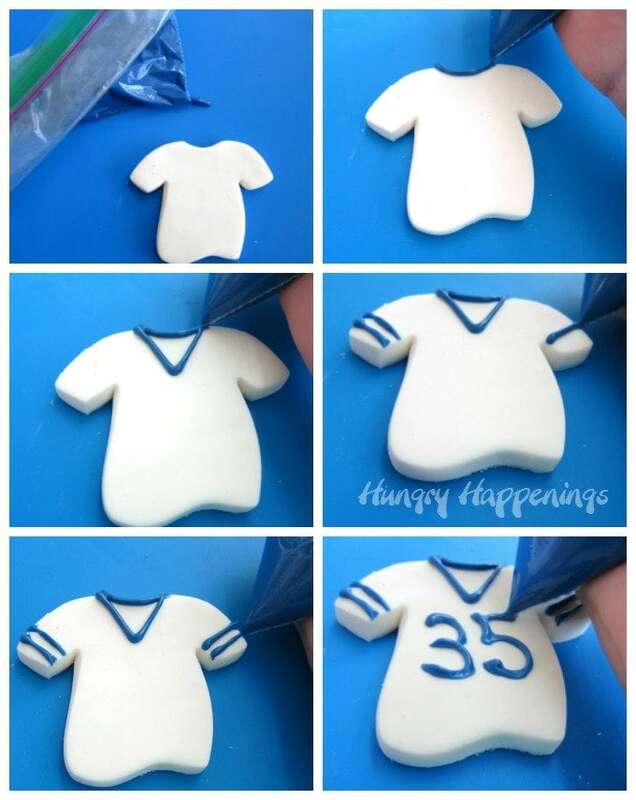 These fudge football jerseys were inspired by another fudge football treat made by Wilton. 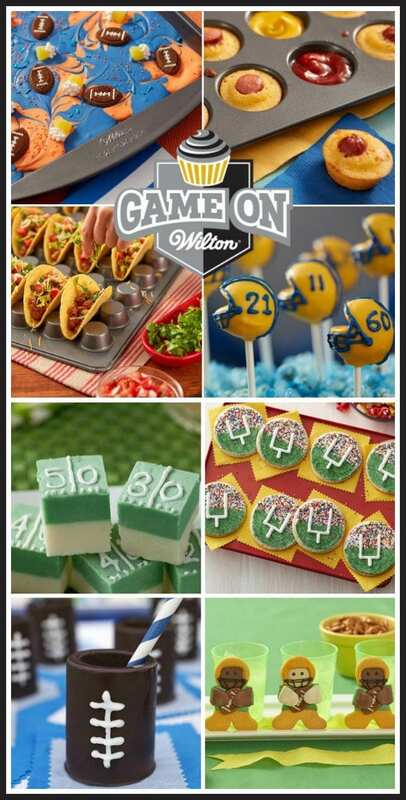 When I first saw Wilton’s collection of Game On tailgating party treats I was really blown away by the creativity. Of course, I am always in awe of the recipes made by the talented designers at Wilton. I loved each and every one of their football party food ideas, but I have to say the Football Candy Melts Fudge is my favorite. Their homemade candy football fields are made with one layer of white fudge and one layer of green fudge. Each little fudge square is then decorated to look like a football field. The idea is so simple, yet so genius. When I saw this fun candy idea I was inspired to use fudge to make my football jersey treats. Wilton’s fudge recipe uses Candy Melts along with butter, cream, sugar, corn syrup and marshmallow fluff. It tastes amazing, but it requires standing over a hot stove stirring the boiling sugar mixture for quite a while. I’d rather spend more time decorating my fudge than stirring it, so I chose to use a my go-to, super simple, 2-ingredient fudge recipe using Wilton Candy Melts and sweetened condensed milk. It’s so easy to make and there is minimal stirring required. To make this recipe even easier, I found a way to make it in the microwave. Just stir the Wilton Candy Melts with some sweetened condensed milk and heat for two, short, 30 second bursts of power and the fudge comes together quickly. This recipe makes a luxuriously smooth and creamy fudge and it seriously could not be easier. You can find items needed to make these fudge football jerseys on Amazon.com (commission earned for sales at no extra cost to you). Have some fun designing these homemade 2-ingredient fudge shaped and decorated like football jerseys. They are quick and easy and perfect for your kids sports parties. You can double this recipe and make all your jerseys using one color of Candy Melts just be sure to equally divide the fudge into two 8 inch square pans. Line two 8 inch square pans with parchment paper. Pour the white candy melts into a microwave safe bowl. Pour the sweetened condensed milk over top. Heat on high power in the microwave for 30 seconds. Heat on high power for another 30 seconds then let the bowl sit for 2-3 minutes in the microwave. If needed let bowl sit another few minutes and stir again. If lumps of candy remain, heat for 10 seconds and stir again. Pour fudge into the prepared pan. Remove and flip upside down onto a clean piece of parchment paper or a silicone mat set over a cutting board. Peel the parchment paper off the fudge and place the fudge in the freezer for 10 minutes. Remove and cut using t-shirt shaped cookie cutter. If desired, you can re-roll any scraps of fudge and cut out more shirts. Pour melted blue Candy Melts into a zip top bag and snip off one tip. Pipe numbers and stripes onto each of the fudge shirts. Let candy melts dry before packaging or serving. Pour blue Candy Melts into microwave safe bowl. Pour remaining 7 ounces of sweetened condensed milk over top. Being our local high school football team’s colors are blue and white and the team has home and away game jersey’s in opposite colors, I decided to make both white jerseys with blue numbers and blue jerseys with white numbers. You can use the Candy Melts that match your team colors to make your jerseys. I divided the can of sweetened condensed milk in half and made one batch of white fudge and one batch of blue. 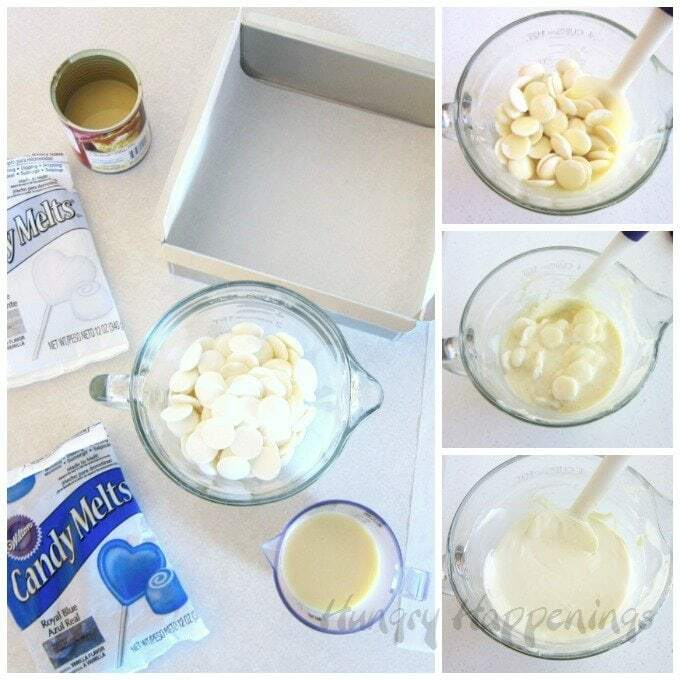 If you make one full batch using one color of candy melts then either use two 8 inch square pans or one 9×13 inch pan. Just note that you’ll get fewer shirts using the 9×13 pan and they will be a bit thicker. In order to get nice cuts, be sure to chill your fudge for at least 30 minutes, then remove it and flip it over onto a silicone baking mat or another clean piece of parchment paper and peel off the top paper then pop it in the freezer for 10 more minutes to allow the fudge to firm up even further. 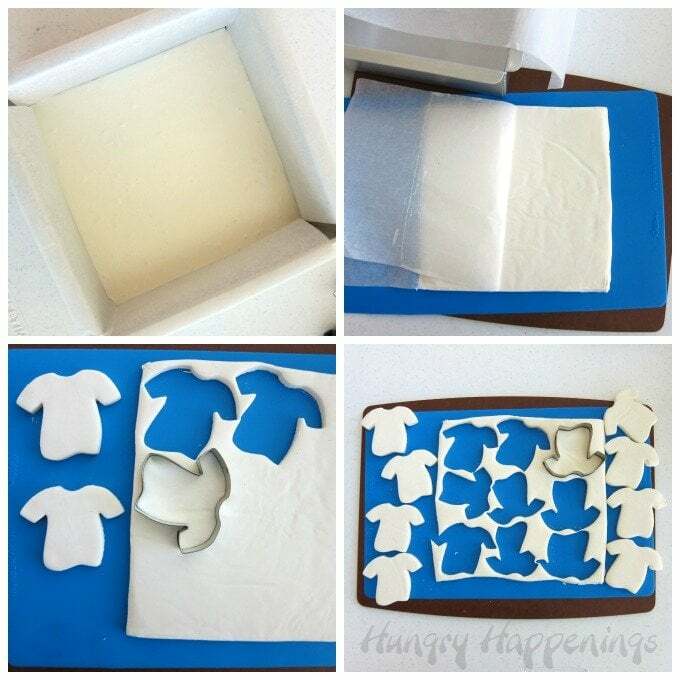 Once it’s firm, use a t-shirt cookie cutter to cut out as many jerseys as you can from each batch of fudge. I got 9 from one 8 inch square, then was able to knead the scraps together, refrigerate the fudge until firm again, roll it out and cut more. I got 12 jerseys from each batch for a total of 24. 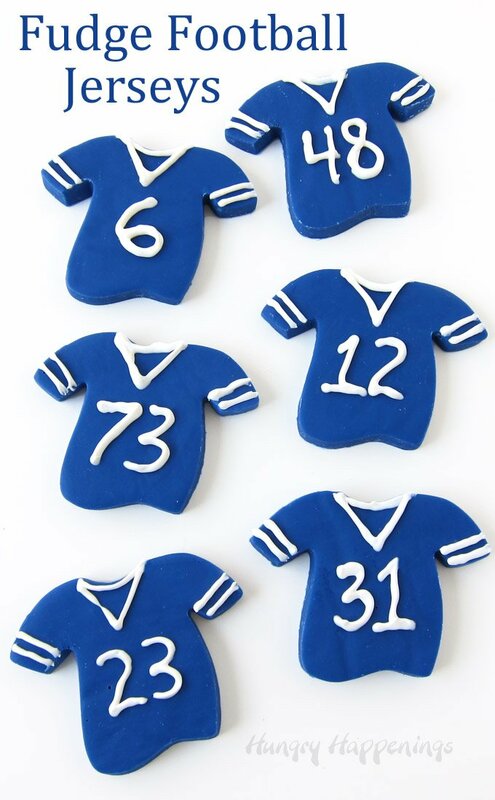 To decorate the fudge football jerseys, pour the candy melts into a zip top bag, snip off one tip, and pipe stripes, a collar, and a number onto each. If your team’s jerseys have a different look to them, decorate them accordingly. Let the candy dry before packaging or stacking them. Wilton was a sponsor of our Fun Food Blogger Retreat and they covered expenses for the event in exchange for posting this recipe. All opinions expressed here are my own. If you make some of these Fudge Football Jerseys be sure to snap some pictures and send them to me at beth@hungryhappenings.com so I can share them in my Readers’ Gallery. Did you say fudge and football? Sign me up, it’s the perfect team for me! Yes, yes I did! I know your jerseys will be orange and blue.